I mean, easy pizza recipe, like what more could you want? To be honest ever since I moved back from Italy I have wanted to make a pizza and the other week I was in Tesco and saw these little pizza dough packets and thought "yep, me and the geek are making one this week" obviously you can make it from scratch which is quite easy anyway but if you just wanted to do something quick then these little pizza base mix bags are quite handy! Before you get started just whack the oven on so it's nice and ready. Throw the pizza base mix into a bowl and add the water until it because a large sticky ball. The on a floured surface you can start to really work the dough and sorry but you're gonna have to knead it for around 5 minutes. After all the kneading, you need to shape it, we went for a more rectangular shape because it would fit in the over a little easier, once you have it shaped you need to put in in a warm place for around 10 minutes. 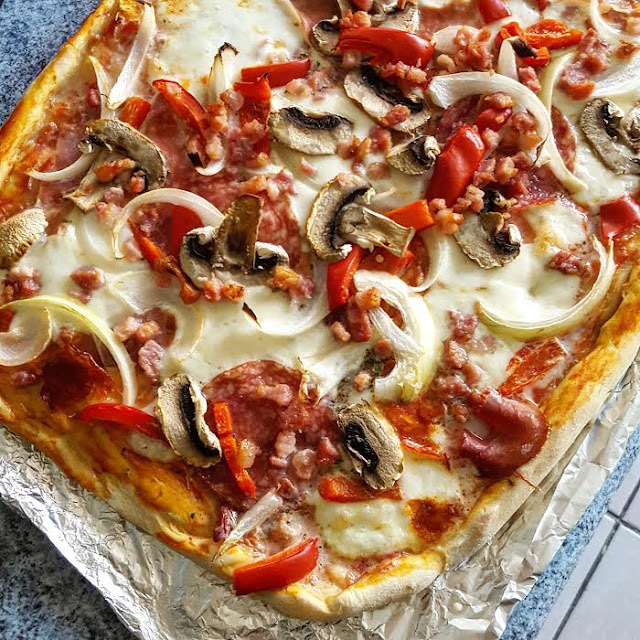 Whilst the dough is resting then cut up all your veggies and cheese so you have that all prepared. 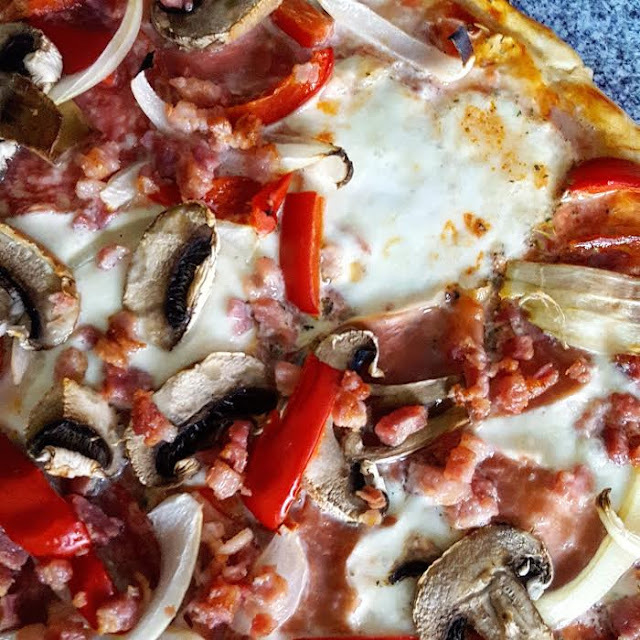 We decided to cook the pancetta before adding it to the pizza just to make sure it was cooked properly really. Things to consider are the types of meat you use, you have to remember that salami and chorizo is an oily/fatty sausage so you don't want to use too much! Once the dough has rested, we added pasata which I prefer to use rather than tomato puree just for the taste, it's runny though so you don't need to be too liberal with it. 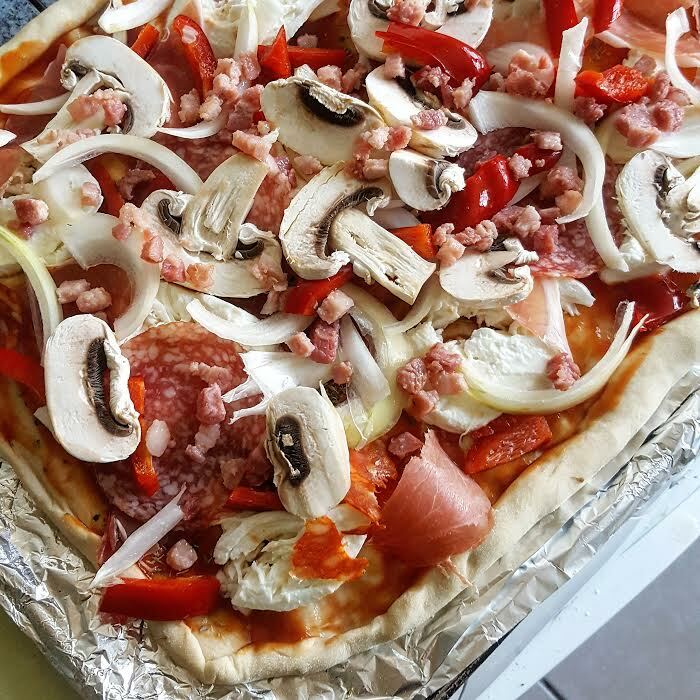 We then added some italian herbs then went for the mozzarella, meats, veggies and sprinkled the pancetta on last. You then put it in the oven for 20 mins and you're done! 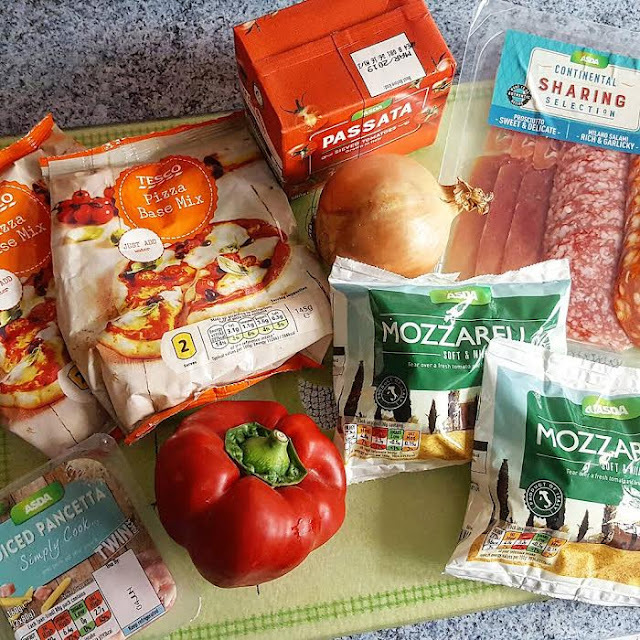 There we have it, a super easy pizza recipe!